Thanks to Ben Ged Low, in town visiting the science team with the Safire group – we appreciate your time filming our pieces! This is just a preview of some of the work and film we will be showing tomorrow at MIT – it’s our wrap-up lecture from a busy and rewarding IAP session. Big thanks to Erik Demaine and to MIT for hosting us. Thank you for the commitment and work put into this most inspirational project. The visual was fabulous. Much appreciated. Inspirational!!!!! Can’t wait to get the book. Is the book ever coming out? Of course it is. Soon. Amazing geometric art. So beautiful. I’m in awe! What beautiful hands……especially the first set. Is she a vegan gym rat by any chance? Gorgeous work also. The wonders of the mind to even think of some of these ideas. Totally fascinating and wonderful. It’s been a treat to see these amazing pieces. Science you can hold. OMG! All these amazing new shapes and forms. You are definitely sucking us into the wonders of geometry! This is soo interesting, Thankyou for showing! Awesome! The movement….the colours….the forms… Who knew that little glass beads could do so much. Thank you so much to all those involved in CGB. You all rock. These are so amazing! 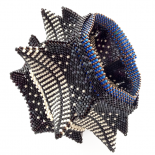 Miniature works of art that move – beaded transformers! Wow!! So fascinating-could watch these forever. Are all of these done with Delicas or Aikos? Most are done with Delica 11s, sometimes accented with 15s. Some beaders use Aikos, some round seed beads, but most of us are on Delicas. Thank you so much! The beadwork is absolutely mind blowing! So inspiring and motivating. This entry was posted on January 31, 2019 by katemckinnon.